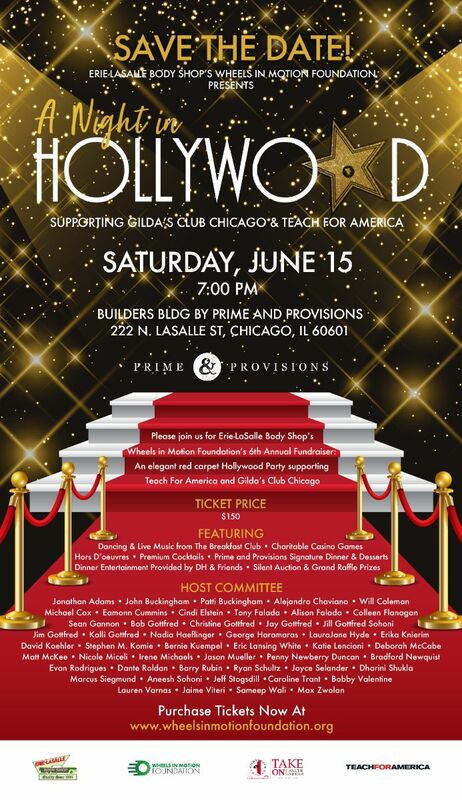 Join Erie-LaSalle Body Shop’s Wheels in Motion Foundation’s 6th Annual Fundraiser: An elegant red carpet Hollywood Party supporting Teach for America and Gilda’s Club Chicago! See and be seen walking the red carpet at this elegant evening, hosted for the very first time at Builders BLDG, featuring live entertainment, charitable casino gaming, signature dinner from Prime & Provisions, and specialty cocktails from the open bar! Plus incredible prizes await you at the silent auction, live auction and casino raffle!